The 100th Infantry Battalion is the only infantry unit in the United States Army Reserve. In World War II, the then-primarily Nisei battalion was composed largely of former members of the Hawaii Army National Guard. The 100th saw heavy combat during World War II, starting in September 1943 and continuing after being attached as a battalion of the 442nd Infantry Regiment, another mostly Nisei military unit, in June 1944. The unit was unofficially nicknamed the Purple Heart Battalion, with the motto "Remember Pearl Harbor" and "Go for Broke", which was later adopted by other Japanese-American units. Based at Fort Shafter, Honolulu, Hawaii, the 100th Battalion continues the legacy of the 442nd Infantry Regiment, officially designated as 100th Battalion/442nd Infantry Regiment. The 100th Battalion/442nd Infantry Regiment has maintained an alignment with the active 25th Infantry Division since a reorganization in 1972. This alignment has resulted in the 100th's mobilization for combat duty in the Vietnam War and the Iraq War. The 100th Infantry Battalion is staffed with reservists from Hawaii, American Samoa, Guam and Saipan. In 2014, under the U.S. Army's new "Associated Units" program, the 100th Infantry Battalion has been aligned under the Regular Army's 3rd Infantry Brigade Combat Team, under the 25th Infantry Division. On the morning 7 December 1941, the United States was attacked by the Empire of Japan, marking the beginning of World War II for the United States. After the attack, Japanese-Americans and those of Japanese descent faced prejudice at home. Chaos ensued in the hours that followed the Pearl Harbor attack, but the 298th and 299th Hawaii National Guard prepared for an invasion, cleared the rubble, donated their blood, and aided the wounded. However, three days after the attack, the units' rifles were stripped from them because of the ethnicity of members; eventually those rifles were returned. Nisei that were a part of the ROTC program at the University of Hawaii were discharged from the Hawaii Territorial Guard. Those former members eventually formed the Varsity Victory Volunteers. At 11:30 a.m. martial law was declared and Governor Joseph Poindexter told President Franklin D. Roosevelt that his greatest fear was sabotage by the large Japanese population in Hawaii. The FBI rounded up known Japanese sympathizers, Buddhist priests, language school principals and teachers, civic and business leaders, fisherman, and instructors of judo and related martial arts. The War Department discharged all soldiers of Japanese ancestry, had all Japanese-Americans on the West Coast rounded up and placed in internment camps around the U. S., deactivated of the Hawaii Territorial Guard, and had all Japanese-Americans reclassified as 4-C: enemy aliens. History says[by whom?] General Delos Emmons, appointed military governor on 17 December, supported placing Japanese-Americans in internment camps and having them reclassified as enemy aliens, but in actuality he wanted to give them a chance to prove their patriotism. After General Emmons agreed to let the Varsity Victory Volunteers form, a confidential memo was sent to the War Department in early April 1942 stating that there were 2,000 Japanese-American soldiers now serving and many more who wished to serve to demonstrate their loyalty to the United States. Their desire was to organize into a fighting force to be sent to Europe or Africa to fight the Germans and Italians; that request was later denied by the War Department. As the Battle of Midway was well underway on 4 June 1942, 1,432 Nisei of the Hawaii National Guard had their weapons taken away and boarded the U.S. Army transport USAT Maui, formerly a Matson liner, under the cover of night and shipped to the mainland without saying goodbye to their family or loved ones. Under the title "Hawaiian Provisional Infantry Battalion" the week-long zigzag journey took them to a port in Oakland where they were designated the 100th Infantry Battalion on 12 June 1942. The unit number was an indication of the Army's recently formulated plan for a modern organization for the Combat Arms. Under normal pre-war Army procedures, all infantry battalions were organic to the regiment they were a part of, and were known as, for instance, "1st Battalion, 5th Regiment." With the new system of organization, the infantry regiment was reorganized as a headquarters with no organic battalions, but with three separate battalions attached. The headquarters was organized into three combat commands that could be dispatched on separate combat actions with units that were attached. One infantry battalion would be assigned to a combat command, with attachments from the higher headquarters reserve. The 100th, however, was not initially attached to a regiment. It came to be unofficially known as the "One-Puka-Puka" (Puka means "hole" in Hawaiian). In Oakland, the 100th boarded a train to their final destination, Camp McCoy, Wisconsin. 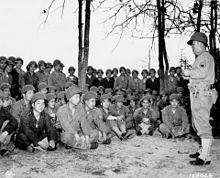 Immediately following their arrival to Camp McCoy many of the Nisei felt animosity and distrust from fellow soldiers and military and political leaders. The 100th was quartered in tents, four soldiers per tent, which contained a bunk bed, blanket, towels, and backpack. It would be several months until the Nisei moved into military barracks. Eventually soldiers were permanently placed into military units, such as Companies A through E, and pushed through physical, marksmanship, and tactical training. Some of the white officers and NCO's appointed to the 100th were schooled in psychology and were ordered to test their physical and military capabilities but most of all their loyalty. The Nisei competed with other companies in marksmanship, baseball, softball, physical combat such as scuffles, boxing, and wrestling. On one such occasion that happened to prove the loyalty and bravery of the new recruits, five Nisei soldiers received the Soldier's Medal for their rescue of several local civilians from drowning on a frozen Wisconsin lake. On one occasion, about 25 of the Japanese-American soldiers were sent to a secret training mission on a small island, Cat Island, near the mouth of the Mississippi River. Some top military officers thought that the "Jap" soldiers smelled differently, and that the Nisei soldiers would give off a similar scent. So for three months these 25 Nisei were ordered to train attack dogs to "smell Japs." The training didn't work. Training at Camp McCoy lasted six months until on 6 January 1943 the 100th Battalion was transferred to Camp Shelby, Mississippi. The 100th was attached to the 85th Division under Major General Wade Haislip and would receive even tougher training than they did at Camp McCoy. Upon arrival at Camp Shelby the 100th received the same amount of skepticism as they did at McCoy. The 100th successfully passed the training exercises. At Camp Shelby where 100th received its most intense and advanced training and then was sent to Camp Clairborne, Louisiana for field exercises and war games. On return from Camp Clairborne, the 100th met up with the newly formed 442nd Regimental Combat Team on 16 July. On 20 July 1943 the 100th received its battalion colors and motto, "Remember Pearl Harbor," as requested by the unit. After training at Camp McCoy, Wisconsin, and Camp Shelby, Mississippi, the battalion was ready to deploy, but was refused by General Dwight D. Eisenhower. Lieutenant General Mark Wayne Clark, commanding the United States Fifth Army, accepted the offer, and the 100th deployed from Shelby on 11 August by train to Camp Kilmer, New Jersey and then to the Mediterranean on 21 August 1943. The 100th arrived in Oran, North Africa on 2 September 1943 and became a part of the 133rd Infantry Regiment under the 34th Infantry Division and took part in training with Caucasian soldiers. On 19 September the 34th Division sailed from Africa to southeast of Naples, with the 100th with them. The unit were to fight in the Italian Campaign and entered combat on 29 September 1943, near Salerno in Southern Italy. The unit advanced 15 miles (24 km) in 24 hours for a week against strong enemy resistance which allowed them to take Benevento, an important rail center and road intersection. The 100th crossed the Volturno River three times, taking on heavy German machine gun fire and rocket launchers before driving the German force even further north. When you read that a town was taken, or a certain hill was taken, remember that in the process of that accomplishment lives of fine fellows were lost, and also, that during this accomplishment for the participants, life was a horrifying massacre. You lose your buddies-fellows with whom you laughed, ate, slept, sweated. They grow to be more than mere buddies. They become blood relations to you and they die before your eyes-not a pleasant, natural death, but an unimaginable kind of mutilation mixed with groans and prayers ending with a gurgling last breath. Only five minutes ago you might have been laughing with that buddy of yours. At the top of Monte Cassino stood a grand but old monastery, a key target for the 5th Army. To take the Gustav Line, the Allies would have to descend into the Rapido River valley, traverse two miles of open fields filled with landmines, mud, and knee-deep cold water, cross a swift-moving river, and barbed wire and up the steep, rocky slopes, to the 1500-foot peak of Monte Cassino. From there they would have to ascend still higher to a four-story fortress, with 10-foot-thick stone walls. This was the St. Benedictine monastery. The battle commenced in January. Here they earned their nickname the "Purple Heart Battalion." At night, A and C companies passed their way through the river reaching the wall where the enemy was located and held their ground under intense fire into the next day. B Company was met with heavy machine gun fire as their cover by the smoke screen was blown away leaving only 14 of the original 187 men in B Company to reach the wall. During the first daylight hours our battalion observation post started with 26 individuals including the artillery liaison team communication people and the intelligence section. By nightfall only four of us were left. Major Clough, our Battalion Commander, and myself (Captain Kim) in one location and Pfc Ginger Minami and Private Irving Akahoshi in another location, 20 yards away. Everyone else was either dead or wounded. Major Clough was ordered by Colonel Marshall, 133rd Regiment Commander, to commit "B" Company across the open flats at daybreak. Jim protested that this was a suicide mission. Lieutenant Colonel Moses, the 1st Battalion Commander, to our right, had orders to also commit his reserve company. He protested and said he would personally lead his company because he could not issue such an order without sharing their danger. However, if he survived, he would prefer court martial charges against Colonel Marshall. —Captain Young-Oak Kim, a Korean-American from Los Angeles who served in the unit from 1943 to 1944. The three companies were immediately pulled back to San Micheli the next night. The 100th then was ordered to take Castle Hill, which they did on 8 February. The hill was held for four days dealing with not only machine gun fire but tanks as well. The hill was a key location for it was close to the monastery but the 34th Division's right and left flanks were unable to hold their positions because of heavy German resistance. The 100th was again ordered back. After three days of bombing, the second assault commenced. In one platoon of the 100th only five of forty soldiers survived. The 100th again was pulled back into reserve and replaced by British and Indian soldiers after nearly taking Cassino. War correspondents calling the 100th's soldiers "little men of iron" and the "purple heart battalion." This would be the last time Nisei of the 100th would see combat at Monte Cassino as they were taken back to San Michele to rest and reorganize. It would be here where replacements from the 442nd would come in to replenish the 100th's ranks. There were over 50,000 allied casualties in the battle. Casualties took the 100th's numbers from 1300 5 months prior to nearly 500. Cassino didn't fall until 17 May. After Cassino, the 100th began to receive its first replacements from the 442nd. The battalion was later awarded the Distinguished Unit Citation (later redesignated the Presidential Unit Citation) for its actions on 26–27 June. Following Monte Cassino, the 100th was soon deployed at the Anzio beachhead on 26 March 1944. The allies held a beachhead that spanned 15 miles (24 km) inland going a few miles inland. The battlefield at Anzio was very similar to battlefields in World War I as there was a large stretch of land between both opposing forces declared as "No Man's Land" and both sides didn't go on a large-scale offensive. The sides only fought at night. During the day, soldiers slept. The fall of Monte Cassino finally led to the end of the stalemate on 17 May 1944. Ont 23 May the allies went on the offensive to drive the Germans north. However, the allies needed more information about the enemy, so the 100th was ordered to capture a German soldier. Lieutenant Young-Oak Kim, a Korean American born in Los Angeles, California, and Nisei PFC Irving Akahoshi from the 100th volunteered for the mission and captured two German soldiers. On the push to Rome, Lanuvio, the final German stronghold, fell to the 100th Infantry Battalion. "We had been sitting and living in foxholes at Anzio some 63 days. Then the big push out and the capture of Rome. They (100th Battalion) wiped out the last heavy German resistance we met some 12 miles south of Rome and then it was practically a walk into the city." The 100th was ordered to stay at the roadside on June 4, 10 kilometers from Rome. They watched other troops march by and never saw Rome. Instead, the 100th was taken 40 miles (64 km) northwest of Rome to Civitavecchia where on 11 June 1944, the 100th was attached to the newly arrived 442nd Regimental Combat Team. Because of its combat record, the 100th was allowed to keep their original designation, giving the newly formed all-Nisei fighting unit the name 100th/442nd Regimental Combat Team under the 34th Division. The nation's highest award for combat valor, the Medal of Honor, was conferred upon twenty-one members of the 100th Infantry battalion of the 442nd Regimental Combat Team of World War II. On 5 October 2010, the Congressional Gold Medal was awarded to the 442nd Regimental Combat Team and the 100th Infantry Battalion, as well as the 6,000 Japanese Americans who served in the Military Intelligence Service during the war. 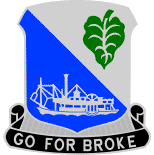 Go for Broke!, a film that dramatizes the lives and wartime experiences of the 442nd Regimental Combat Team and the 100th Infantry Battalion's Hawaiian troops. Only the Brave (2006), an independent film directed by Lane Nishikawa, which is a fictional account of the rescue of the Lost Battalion. ^ "442nd Regimental Combat Team Legacy Website". www.the442.org. ^ Terry Shima (23 January 2006). ""Go For Broke" Battalion Returns Home From Second Overseas Combat Mission. Made Significant Contribution to Defeat Terrorism and to Democratize Iraq". Japanese American Veterans Association. Archived from the original on 23 September 2010. Retrieved 14 February 2011. ^ Franklin., Odo, (2004). No sword to bury : Japanese Americans in Hawai'i during World War II. Philadelphia: Temple University Press. ISBN 1592132073. OCLC 52431037. ^ Tamashiro, Ben. Remembrances: 100th Infantry Battalion 50th Anniversary Celebration 1942–1992. Published and distributed by 100th Infantry Battalion Publication Committee. Pg. 49. ^ Tamashiro, Ben. Remembrances: 100th Infantry Battalion 50th Anniversary Celebration 1942–1992. Published and distributed by 100th Infantry Battalion Publication Committee. Pages. 51, 53. ^ Crost, Lyn. Honor by Fire: Japanese Americans at War in Europe and the Pacific. Novato: Presidio Press, 1994. Pg. 15. ^ "A | More | Perfect | Union". amhistory.si.edu. Retrieved 6 October 2018. ^ a b Sterner, C. Douglas. Go For Broke. Clearfield: American Legacy Historical Press, 2008. Pg. 16. ^ Tamashiro, Ben. Remembrances: 100th Infantry Battalion 50th Anniversary Celebration 1942–1992. Published and distributed by 100th Infantry Battalion Publication Committee. Pg. 71. ^ Tamashiro, Ben. Remembrances: 100th Infantry Battalion 50th Anniversary Celebration 1942–1992. Published and distributed by 100th Infantry Battalion Publication Committee. Pg. 73. ^ Sterner, C. Douglas. Go For Broke. Clearfield: American Legacy Historical Press, 2008. Pg. 17. ^ Tamashiro, Ben. Remembrances: 100th Infantry Battalion 50th Anniversary Celebration 1942–1992. Published and distributed by 100th Infantry Battalion Publication Committee. Pgs. 77 and 79. ^ Sterner, C. Douglas. Go For Broke. Clearfield: American Legacy Historical Press, 2008. Pgs. 20–21. ^ Tamashiro, Ben. Remembrances: 100th Infantry Battalion 50th Anniversary Celebration 1942–1992. Published and distributed by 100th Infantry Battalion Publication Committee. Pg. 83. ^ Tamashiro, Shari Y. (2009). "The Hawaii Nisei Story: Creating a Living Digital Memory" (PDF). Media in Transition 6 Conference. ^ "100th Battalion, 442d Infantry". history.army.mil. Retrieved 6 October 2018. ^ a b c d e "Go For Broke National Education Center - Preserving the Legacy of the Japanese American Veterans of World War II". Goforbroke.org. Archived from the original on 13 August 2012. Retrieved 17 August 2012. ^ Sterner, C. Douglas. Go for Broke. Clearfield: American Legacy Historical Press, 2008. p. 24. ^ a b "Go For Broke National Education Center - Preserving the Legacy of the Japanese American Veterans of World War II". Goforbroke.org. Archived from the original on 22 October 2012. Retrieved 17 August 2012. ^ Sterner, C. Douglas. Go For Broke. Clearfield: American Legacy Historical Press, 2008. Pg. 29. ^ Sterner, C. Douglas. Go For Broke. Clearfield: American Legacy Historical Press, 2008. Pgs. 34 and 35. ^ Crost, Lyn. Honor by Fire: Japanese Americans at War in Europe and the Pacific. Novata: Presidio Press, 1994. Pg. 97. ^ Steffen, Jordan (6 October 2010). "White House honors Japanese American WWII veterans". The Los Angeles Times. Archived from the original on 7 October 2010. Retrieved 9 October 2010. Moulin, Pierre. U.S. Samurais in Bruyeres: People of France and Japanese Americans: Incredible Story. U.S. Army Museum of Hawaii. ISBN 978-2-9599984-0-9. OCLC 29414036.